Specially formulated and ready-to-use, this root-building plant food improve plant growth and increase crops for a garden full of colourful flowers and tasty home-grown crops. 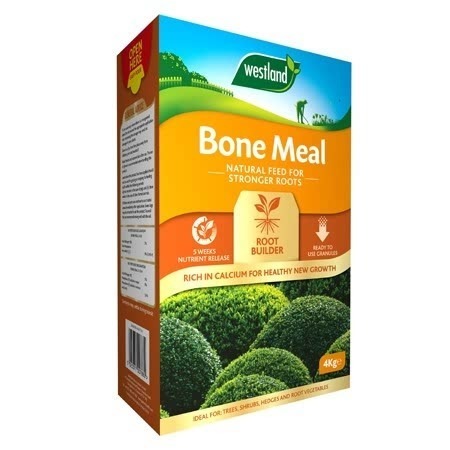 Bone Meal is a fantastic blend, very high in phosphorous. Great news for trees and shrubs it is good for building soil fertility and stimulating strong, healthy root growth which keeps trees and shrubs well anchored in the soil – withstanding wind and the variable UK weather. Particularly rich in phosphorous Bone Meal is perfect for adding to soil just before getting bare-root plants into the ground. With a sprinkle of Bone Meal at the bottom of your planting holes, the roots of your bare-root plants get an initial boost before they get to work under-ground over the winter.